Hi guys, i'm sure these have been asked before but I cannot find them for the life of me (If they've already been answered tell me to bugger off ;p), so I have a few questions. First off, is it a bad idea to go for the flexNT (Here) as a first time instalment? I'm very "Go big or go home," and I like the idea of a reasonable storage size with the NTAG216 chip and larger antenna range. Question two, I notice that most people get their first chip between the thumb and index finger, as this is where it is the least likely to move about or shatter, so would an area like the ear / neck / side-of-head be a bad idea (For either the flexNT or the xNT)? Question three, does an NFC chip have to be a certain format for it to unlock smartphones via Smart Lock? I would like to have the ability to use it as a Smart Lock device while storing a very small amount of data on it, is this possible? Edit: Question four, do NFC chips wear out over time? Do they need taking out after say a year or so? question 4: no. They are passive devices powered by the reader. Unless the antenna fails due to mechanical stress you'r very unlikely to wear it out. There is a limit on the write-cycles but these typically range in the 10 thousands and more. Q1: I don't see why there's a problem with getting the flexNT as a first time as long as you are prepared. Keep in mind that the implant process is a lot more traumatic than a needle implant that is a lot easier for people to go through with for the first time. 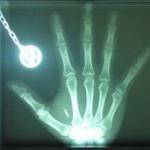 Q2: The implant location on the hand is due to the implants you described being a glass capsule. A flexNT is a little more durable due to being a flexible flat chip. There are more viable implant locations, IMO. That being said, while there is nothing wrong with implanting in the spots you described, it would be very impractical. Most people use these chips for unlocking cars, doors, computers, etc. I cant imagine it being very convenient to have to stick your head or face near the reader every time you use it. That's why most people use the hand. Q4: While most NFC chips can be expected to last a lifetime, and in fact the glass capsule ones may do just that, the flexNT is coated with a less durable polymer that is likely to wear out over time. I think it would be a stretch to think that a product like that, that hasn't been around long enough to prove itself over time, would last a lifetime. Q3: I unlock with the flexNT my smartphone (Smart Pass Lock) The App is very old, last update 2016. First it mades troubles with Android 7 - but know it works. I refuse the last update. I've decided on sticking with the flexNT, but I'm implanting it above the proximal phalanx on my ring finger, I've also decided to get the help of one of my friends in the tattoo and piercing field to help out, instead of doing it DIY style (I don't know why I thought that was a good idea).